Winter is here and we girls definitely need excellent backup to maintain the beauty all winter along. Our skin needs extra care during cold weather because it makes your skin dry and rough. Chapped lips, cracked heels, itchy skin and dry hands are the major skin problem especially for girls. 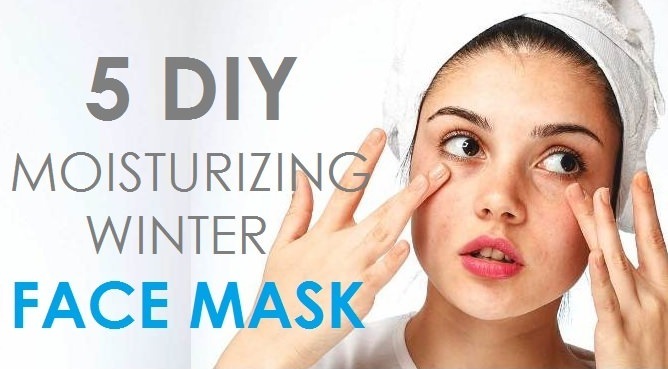 Instead of buying chemical products from the stores, you can take care of your skin by using homemade face mask and scrub specially customized for cold season. Today I am showing you 5 best winter face masks that boost radiance and hydrate your skin, simply says, Goodbye dull winter skin. The combination of avocado, egg yolk and honey will be become a nourishing face mask and it will make your skin moisturized even in cold. Egg yolk will plump your skin and helps to reduce blemishes marks. Blend 2 tablespoons of fresh avocado flesh, 2 tablespoons of honey and one tablespoon of egg yolk in the blender to get a smooth paste. Apply this paste on your face and neck using your fingers. Allow it to dry for at least 30 minutes before rinse. Follow the process once a week to get excellent results. Oatmeal mask is one of the best nourishing and hydrating face mask for the winter. It will make your face refresh and rejuvenate. Take a bowl and add equal amount of oatmeal flakes, honey and yogurt in it. Mix them well and apply it on your face. Leave it for 30 minutes then wash your face with warm water. Follow the method 2 times in a week to get instant results. This is very simple face using honey and raw milk. It is easiest remedy to treat dry and rough skin during the cold season. This face mask will give you glow on face and moisturize your skin deeply. Mix together 5 - 6 tablespoons of raw milk and 2 tablespoons of honey. Apply this smooth paste on your face and neck. Massage it gently for few minutes. Then, leave this paste at least 20 minutes before wash off with lukewarm water. Banana is another beauty ingredient that helps to make your skin hydrate and prevent dryness in the winter season. It also makes your skin smooth and younger-looking. Put half ripe of banana in a bowl and mash it using the spoon. Now add 1 tablespoon of yogurt and 1 tablespoon of honey in it and mix them gently. Gently apply this paste on your face. Leave it for about 20 minutes, and then rinse it with lukewarm water. Repeat it once in a week for effective result. This strawberry and lemon face mask is most suitable for those girls, they have redness problem in the cold weather. Strawberry is rich in salicylic acid to it helps to prevent you from skin breakouts like acne, pimples, etc. Take handful of strawberries, 2 tablespoons of lemon juice and 1 tablespoon of honey. Blend these ingredients in a blender until it becomes smooth paste. Spread this paste on your face for 20 minutes and then rinse it. Check out 5 DIY Body Scrubs for Glowing Skin here at @BeautyEnhancers.